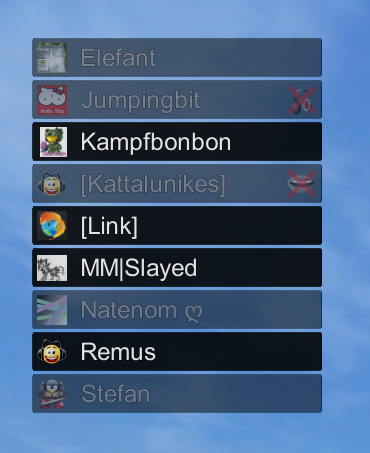 Additionally to our public-server list you can keep track of your most-visited servers by adding them to your favourites. And too keep track of your friends even across servers, our certificate-based authentication system allows you to add friends and you will be able to identify them even on different servers where they use different nicknames. Additionally to our '''public-server list''' you can keep track of your most-visited servers by adding them to your '''favourites'''. Too '''keep track of your friends even across servers''', our certificate-based authentication system allows you to add friends and you will be able to identify them even on different servers where they use different nicknames. This page highlights the biggest and most important features. Try Mumble out and explore for yourself what else is available! We provide official source-code and binary releases for Windows, Linux and MacOSX desktops as well as an official iOS client. We would love to see an android client as well, but there is no client available yet. http://mumble.sourceforge.net/static/audio_wizard_qn_page_s.png For our first time users we provide two wizards for easy and elaborative configuration of the client. They explain and ask the user to configure his set-up interactively. The certificate wizard will guide the user through the generation of a user certificate or importing of an already existent certificate. The audio wizard on the other hand will guide the user through setting up his microphone, audio devices and levels and interaction (voice activation or push to talk?) to an optimal set-up. http://mumble.sourceforge.net/static/overlay123_s.pngThe official Mumble desktop client features an overlay drawing status information in your rendered applications. This way, you can see who is listening and talking from within your game. An OpenGL overlay is provided for Windows, Linux, and MacOSX. For Windows, a Direct3D 9 and 10 overlay is provided additionally. We are aware of the often wanted feature of a Direct3D 11 overlay on Windows and would appreciate any help in documenting the issues on overlay as well as help implementing it. As our main authentication system we use certificates since version 1.2.0. Certificates can essentially be considered very long and variable - and thus very secure - passwords. Our password-based authentication is still in place as a fall-back solution, but using certificates is the default and highly encouraged. A server may even provide authentication through an pre-existant user database, meaning - in case the server provides it - you can log in to the account you registered on the hosters website/forum. Of course our desktop client is skin-able. Change the colouring and layout to your liking or download one of the pre-made communtiy-provided skins. As for yourself, limited only by the servers settings, you can choose your user-name to your liking and use a custom avatar-image that will display as your user-information in the client as well as in the Overlay. As for feedback you can use our text-to-speech integration to hear what messages are being sent to you, or just let audio cues play. You can even customize the type on a per-message-type basis. Additionally to our public-server list you can keep track of your most-visited servers by adding them to your favourites. Too keep track of your friends even across servers, our certificate-based authentication system allows you to add friends and you will be able to identify them even on different servers where they use different nicknames. We allow you to enable positional audio for your games, so you can actually hear your play-partners from the direction they stand in in your game! Real 3D sound! Some games provide native integration of Mumble, for others we need to provide custom readers. Unfortunately, these break with game-updates most of the time. In that case, we appreciate any feedback and help in implementing a new reader with the appropriate location of positional data (see HackPositionalAudio and Pluginguide). Alternatively, asking the developer to implement our Link plugin may eventually lead them to do it and game-updates would not break it anymore. To implement low-latency audio communication while maintaining high audio quality choosing the audio codecs needs good evaluation and choosing. Our development snapshow versions and thus the upcoming version 1.2.4 will feature the new codec Opus. It is the free and open resulting standard from a collaborative effort producing the best audio codec ever seen to date. It performs superb in all usage areas, contrary to traditional codecs. If you want to read more on the greatness of Opus, see the Mozilla announcement for example. Opus will replace our current main codec CELT, which was introduced in version 1.2.0. For quite some time, CELT will still be the fall-back codec integrated into Mumble, ensuring interoperability with earlier versions of Mumble. If you own a G15 keyboard (with an LCD screen) you will be able to see information of Mumble on it! With Bonjour we provide you the option of LAN-discover-ability of Mumble servers. 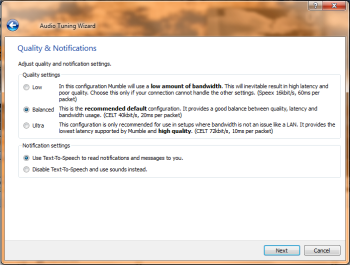 The Mumble desktop client provides optional audio attenuation. On Windows we use our own implementation for this to acquare a more consistent and expected result for a continuous VoIP program like Mumble (in contrast to windows you-get-a-VoIP-call-interrupt take on it). Attenuation is available on Windows using the WASAPI Sound System and on Linux using PulseAudio. With our free software servers and liberal licensing, as well as pre-packaged server binaries we try to make it very easy and simple to set up a running server. Additionally, using encrypted connections all the time, using certificates for authentication and an always-existant SuperUser account your server will be secure from the start. The various ways of configuration and extendability - as well as the free licensing again - provide great options for any admin that wants to get more out of a server and communication platform. We also allow you to allow your users to create temporary channels for a highly dynamic and descriptive usage. For a (channel-)password-like usage we provide access tokens. Through priority speakers you can mark certain individuals more “important”, effectively decreasing other peoples volume when the priority speaker talks. Through providing data for the Ice middleware we allow server administrators to use scripts on their servers. Be it authenticators for authenticating against an existing website user-database, chat-command scripts, AFK-move-scripts or other fancy or playful things. ZeroC Ice has bindings for a number of programming languages like C++, .NET, Java, Python, Objective-C, PHP, Ruby, ActionScript. In version 1.2.4 you can provide custom right-click menus via Ice and even change them without the need of a reconnect like in previous versions.